Northern Arizona University student vocal groups will share a stage with one of the most renowned vocal ensembles in the country, New York Voices, when they perform at the Jazz Madrigal Festival Host Concert at 7:30 p.m. Feb. 7 at Ardrey Memorial Auditorium. Known for their impeccable voices and stunning arrangements, New York Voices will be joined onstage by the NAU vocal jazz ensembles Northern Voices and High Altitude. 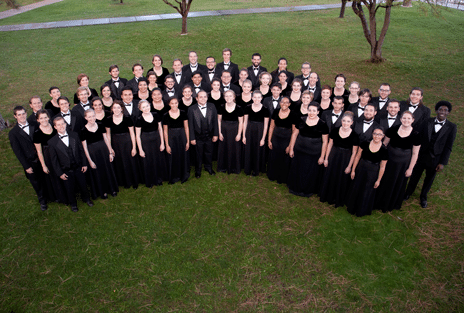 Opening the concert is the NAU Shrine of the Ages Choir directed by Edith Copley, Regents’ professor in the School of Music. 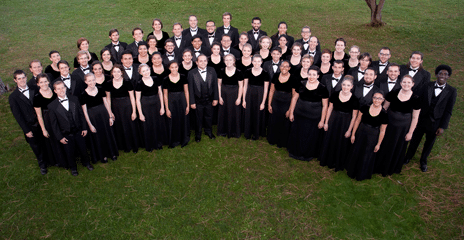 The Shrine of the Ages Choir consists of undergraduate and graduate students of various majors who are dedicated to the common goal of musical growth through the study and performance of outstanding choral repertoire. Having an event with an established group like New York Voices allows NAU students the valuable experience of performing with and learning from experts in the music field. “There is a song to inspire every listener,” graduate choral student Katie Sheridan said. The concert is part of NAU’s Jazz Madrigal Festival, one of the largest festivals of its kind in the United States. Students from more than 140 high school ensembles in the Southwest attend the festival, where they have the opportunity to work with professional musicians, attend clinics, perform and more. The festival, held Feb. 7-9, is hosted in numerous venues on campus and in the Flagstaff community. Tickets for the Jazz Madrigal Host Concert are $20 for adults and $16 for non-NAU students, seniors and NAU faculty and staff. The concert is free to NAU students with ID. Tickets can be purchased at the Central Ticket Office at the University Union, the CTO website, or by calling 928-523-5661. The Jazz Madrigal Host Concert is sponsored by The Northern Arizona University Student Activities Council (STAC) and the NAU Student Chapter of the American Choral Directors Association. As an alumni member, married to another ASC alum, we are BOTH Shrine of Ages alums (from different years!) but we have not forgotten “Mom and Pop” Ardrey, OR Mel….and what an enriching part of our student life that whole experience was for us! I am delighted that the melody lingers on! Enjoy! As an alumni-member, married to another alum from ASC, I am delighted that you are still singing! We recall, fondly, “Mom and Pop” Ardrey (AND MEL) and our experiences (in different years!) from choir tour. The Madrigal Festival should offer you the chance to keep on singing, and learning!